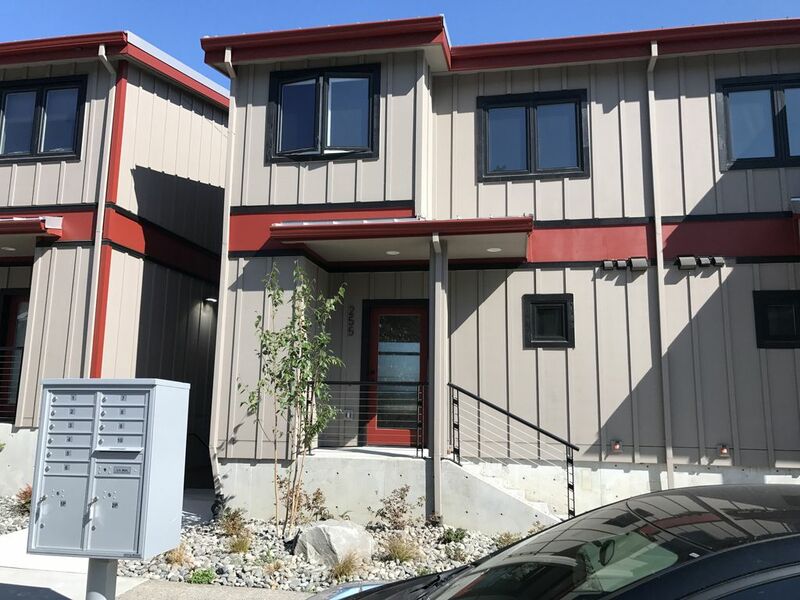 Brand New - Two bedroom+ Den, 2.5 bath, Sleeps Six. Gorgeous Views. Beautiful brand new industrial style townhouse with sweeping views of the Columbia River and historic Troutdale. Located across the street from the Troutdale House, walking distance to outlet mall, one mile from Edgefield, three miles from the Riverview Restaurant, and only eight miles from Portland International Airport. 2 bedrooms, 2.5 baths and den. The location is perfect for trips to the Gorge, Skiing on Mt. Hood, taking in a concert at Edgefield or visiting Portland. The townhouse was built in 2017 and has a lite airy and open floor plan with sweeping views of historic Troutdale and the Columbia River. It has been furnished with guests comfort in mind and to reflect the natural beauty of the Columbia River Gorge Area. The house is fully air conditioned and insulated to the high energy standards. Here is information about each room area within the townhouse: First Level: Living Room/Dining Room: One of my favorite places to relax. Expansive windows that frame a territorial view of Washington State and Historic Troutdale. Balcony to take in the views and get fresh air. Large 65" flat screen smart TV with access to SLING TV and Netflix, blue ray player and blue tooth soundbar. High speed internet. The dining room has a table that seats six and extra bar stools for counter seating. Kitchen is fully appointed with all the necessities of a luxury modern home. Half bath and Laundry Room: Full size washer and dryer. Iron, ironing board, first aid kit provided Second Level: Master Bedroom: Large open vaulted ceilings with windows and balcony that has sweeping views. The balcony is great for having a cup of coffee in the morning or a glass of wine or beer in the evening. Queen size 12 inch memory foam mattress. I have this same mattress in my N. Portland BNB and it gets great reviews for comfort. Reading corner with 46" smart TV, blue ray player with access to Sling TV and Netflix. Master bath has two double sinks, stand up shower and and walk in closet. Shampoo, Conditioner and bath gel provided. Qtips, cotton balls and ear plugs also provided. Second Bedroom: Very quaint and cozy. Queen size 12 inch memory foam mattress. Beautiful reading lamps and your choice of light filtering shades or complete blackout. Den: The den is open to the hallway. Great place to relax and read a book. Doubles as a very comfortable sleeping area. Daybed has an eight inch memory foam twin mattress with a twin trundle. Combined it will sleep two adults easily. The den also has a combination light filtering or complete blackout shade. Shoji screen provided for privacy. Guest Bathroom: Bath/Shower Combination. Bright and clean. Shampoo, conditioner and bath gel provided. Note: Similar to most hotels. I utilize exterior security cameras to monitor the properties two entrances. I use this to assist me in managing the property, ensuring cleaning staff arrive and for overall security. Hi there! I am Ken and my daughter is Gabi. We are a fun daddy daughter team. She is nine years old and lives with me 50% of the time. This is a brand new townhouse. It has beautiful views, decorated to reflect the scenic area you are in and close to about everything. Only nine miles to the airport, 25-mins to downtown Portland, and you can see the Columbia River Gorge area from its two balconies. Amazing views, close to Columbia Gorge wedding venue's, Edgefield for concerts, and a new modern industrial look. It has a beautiful kitchen, comfortable beds and it is just an amazing place. Our stay in Troutdale was short but fun. This unit was very comfortable, new, modern and convenient. The town of Troutdale is small but inviting and is a short walk to dining, pub, shopping, coffee shop and more. It’s perfect location to make the loop up Columbia River Gorge to Hood River, Mt Hood, and back for a fun filled day and abundant scenery.